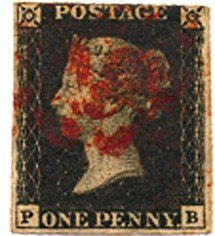 The first postage stamp world-wide was the Penny Black of Great Britain, in 1840. On 6th May 1840, a day that changed the world with the introduction of The Penny Black – the world’s first pre-paid uniform rate postage stamp. This results in the strange concept of sticking a small rectangle of elaborately printed paper onto their envelopes. The Face value for this Black Penny is 1-Penny 168 years ago. Estimated value nowadays is about £3-4000 (mint). At about 168 years ago, the vision of Rowland Hill was realised. Up to 1840, postage was charged on the number of sheets used and the distance to be travelled. Clerks assessed each package and wrote the fee on the letter to be collected on delivery. Hill replaced this cumbersome, expensive process with a single prepaid charge based on weight, regardless of distance. This type of payment was indicated by a ‘small stamped label’ – known as The Penny Black. Introduced on 6th May, 1840, it took its place in history as the very first pre-paid postage stamp. The first US stamps were the 5-cent Franklin and ten-cent Washington (1847). Their success was more modest at first, and soon the first stamp collectors were born.